Have you ever gone back to your old childhood neighborhood but as an adult? You look down your former street and wonder why it looks so small now? That tiny block in my youth once seemed to go on for miles and felt about two football fields wide. 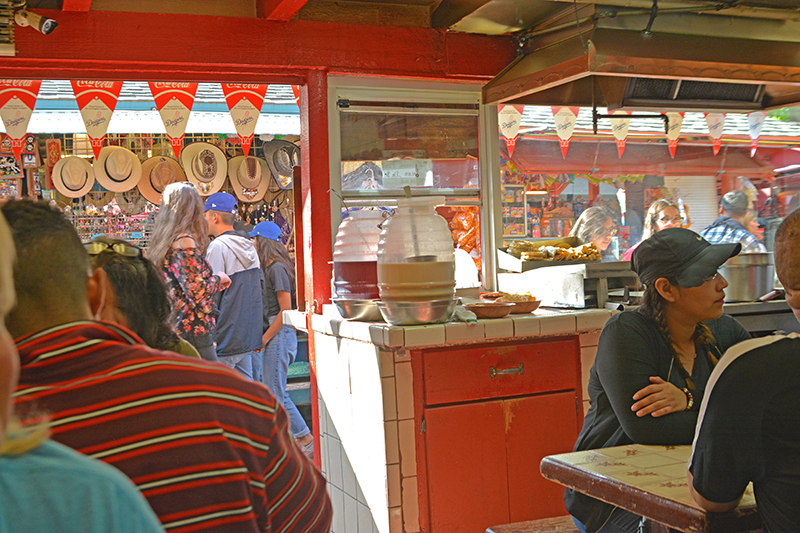 That is my recollection of Olvera Street in Los Angeles. When I went there as a kid it seemed like an endless lane packed with vendors, food, and my favorite…toys! Going there as an adult, the tree-lined street didn’t seem as long. The aroma of authentic Mexican food still filled the air and colorful booths were packed with clothes, hats, shoes, tiles, handmade leather goods, etc. just as they were back then. 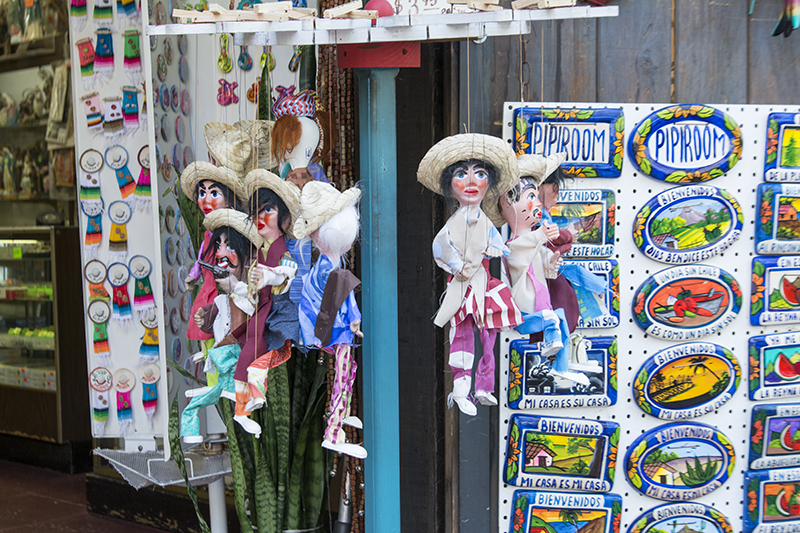 My Mom always bought me one of those wooden puppets that had four strings to control the hands and feet. It was a must have, and I was happy to see that they still sell them there! In fact about ten were hanging on a display where a small boy was tugging on his dad’s shirt asking him to buy him one. With all of the high tech games today, it is nice to know that such a simple toy like that has not been forgotten. 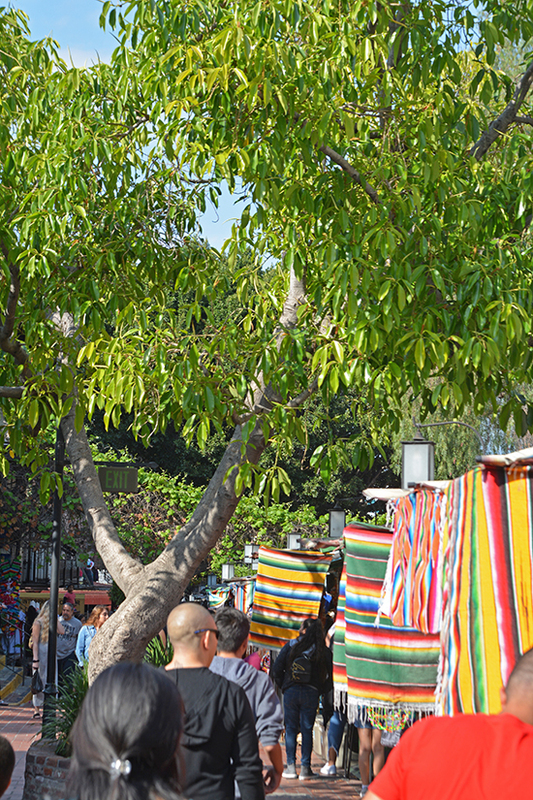 Other than it not being as large as I remember, Olvera Street hasn’t changed much. Even now, the sweet aroma of food floods the air, there is entertainment in the square, mariachis, and the same vendors selling their goods. 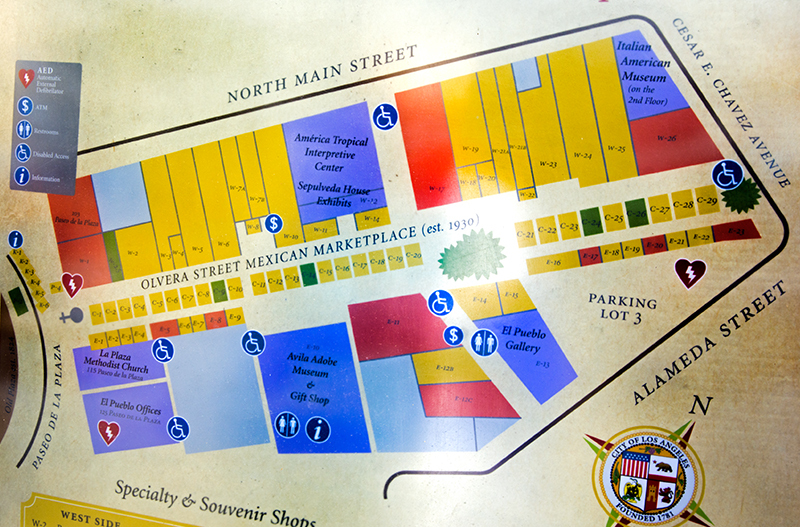 Olvera Street, known as “the birthplace of Los Angeles,” is a block-long Mexican Marketplace that was created in 1930. It preserves the customs of early California and some of the merchants today are actually descendants of the original vendors. Besides the tented vendors, the narrow shaded street features cafes, old structures, and restaurants. There are also brick and mortar stores which are actually brick and mortar! There is main center square where you can sit and watch the provided entertainment which can include bands, dancers, or singers. On this day, a woman dressed in colorful Mexican attire was singing songs that entertained all that were gathered around. To keep with the spirit of the place, we sat down in a hole in the wall café to test out the authentic Mexican food. Based on the crowds, I am guessing that this is how they like it prepared. Nearby, the ball of a homemade tortilla was gently rolled out to soon become a fresh warm delicious staple of the Mexican culture. In our tiny establishment, the popular drink Horchata was pouring into many a glass. I was half inclined to join in, although with a couple of Coronas instead, but I knew I had to drive. I settled for munching on a taco in the back of that four table café while watching a Mariachi band stroll through the crowd. 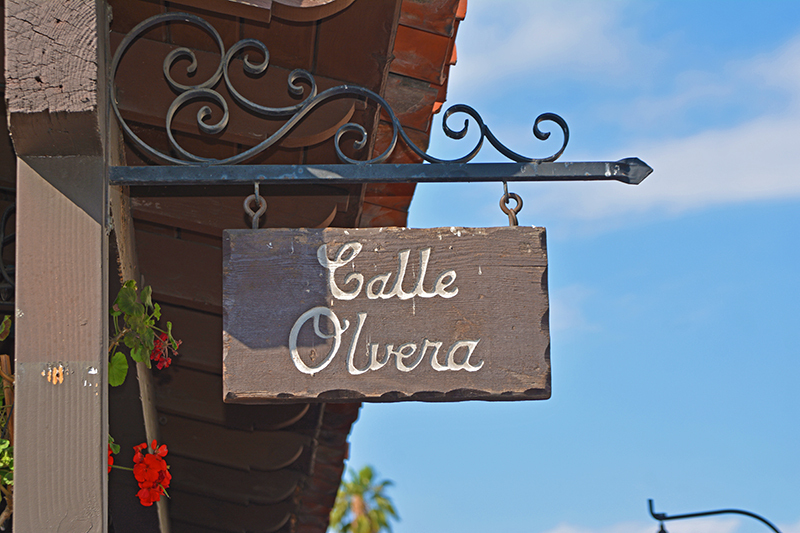 Olvera Street is open 10:00 am to 6-8pm daily and until 8-10pm on the weekends. I like how they leave it open, maybe we will close at 8:00, maybe 10:00. That is the Mexican way, family, home, and food, all important in its own way. 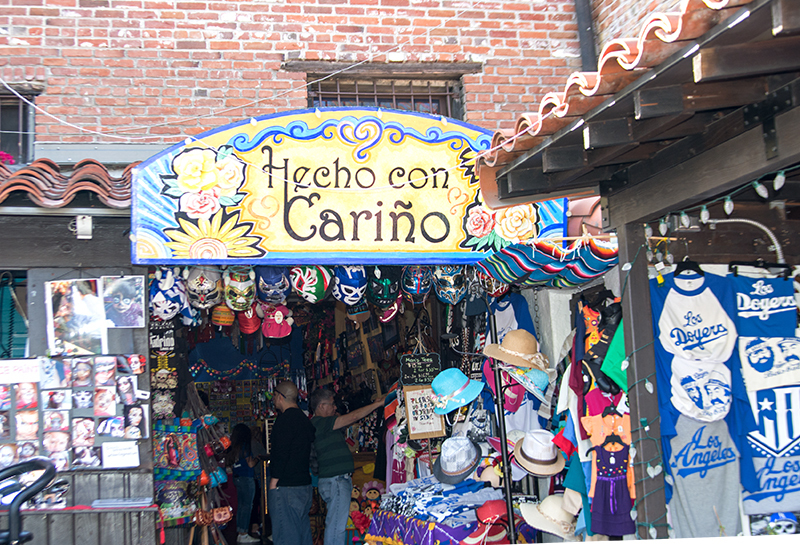 If you are looking for something to do in the Los Angeles area, check out Olvera Street. The best part, admission is free. Next time, we visit Chinatown which happens to be right around the corner. 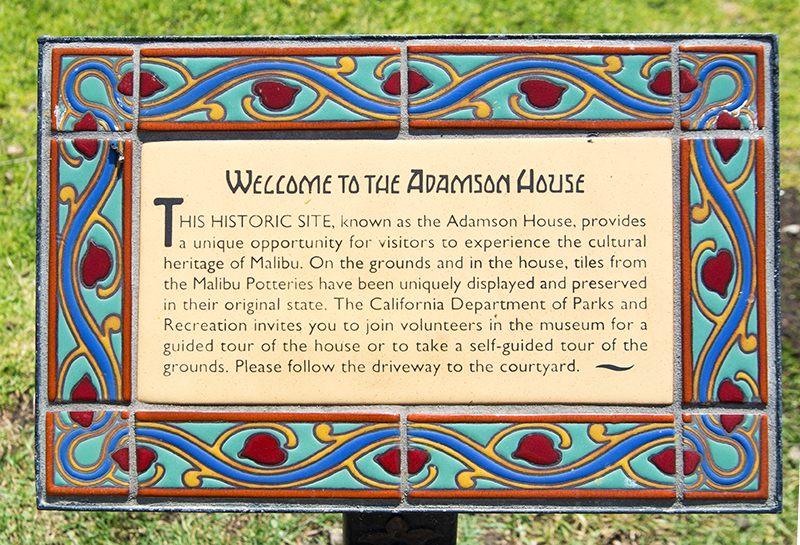 Just perusing Google to find something to do up in the Los Angeles area, we came across the Adamson House in Malibu. This grand home sits on the beach very close to the Malibu Pier so we thought it might be interesting to see what it was all about, plus I have never seen the pier. At the very worst, hanging out by the beach wouldn’t be such a bad way to spend the day. 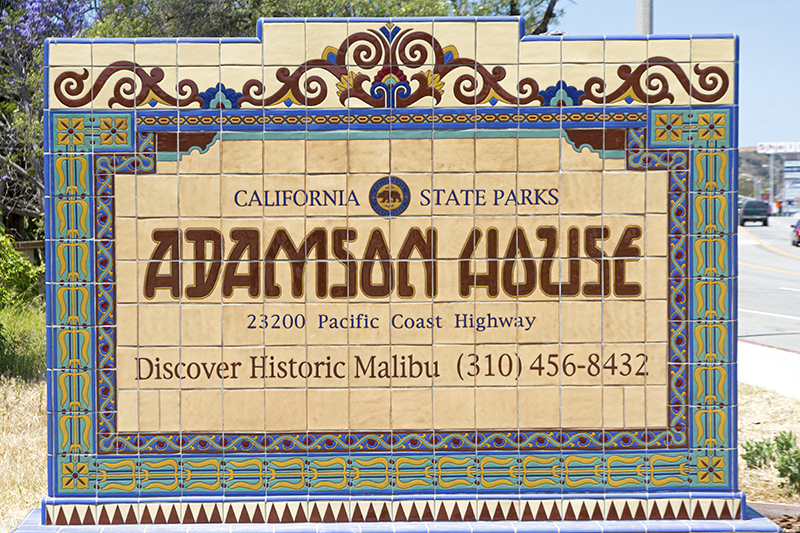 Situated just off of Pacific Coast Highway, we saw the Adamson sign and turned into an all day parking lot that cost a hefty twelve dollars a car. We learned later you could also park on the street to save the parking fees. Since the home is open to the public, you don’t have to pay to just walk around the outside or visit the museum. It is only if you take the inside docent led tour that you have to pay a nominal seven dollars each. The front courtyard. You can walk around without taking the tour. We paid the fee and made our way into the five car garage that has been converted into the visitor center/ museum. There you can view old photos and learn a little more about the beginnings of the house. While in the garage, you are then led to a seating area where the guide proceeds to tell you the history of how the home came to be. My problem is, I am a visual person so I just wanted to get into the house. To top things off, somewhere during our guide’s speech she mentioned that no photos could be taken inside, darn!!!! I started getting antsy, the history lesson was taking way too long. I just wanted the basics but she was getting into the chronicles of both the original families. I looked around and most people seemed to be enjoying the lecture by laughing when they were supposed to or nodding during interesting tidbits. My eyes were wandering, I was officially losing interest. Maybe these types of tours are not for me. So with that in mind I will give you a very brief history. 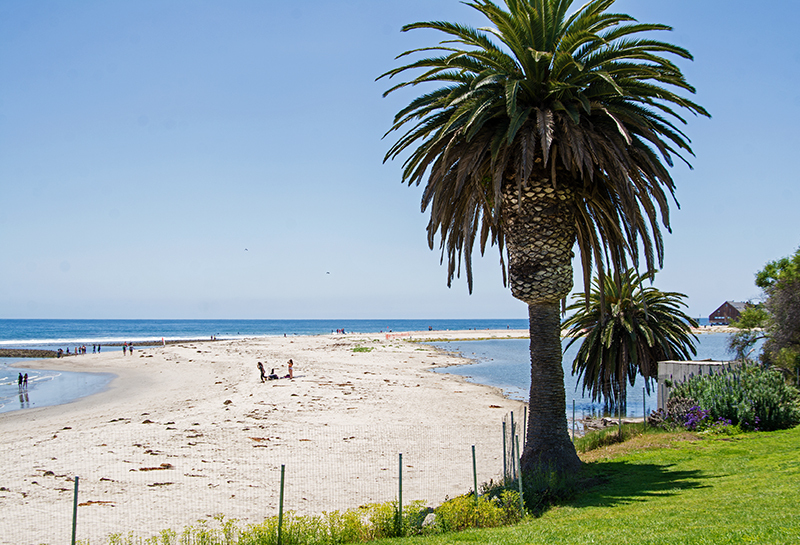 This site was once the home of the Chumash Indians who lived there until the late 18thcentury. Later, the Rindge family owned the location as well as 20 miles of additional coastline and soon the family’s daughter, Rhoda, along with her husband, Merritt Huntley Adamson, used this plot of land to construct a beach house. 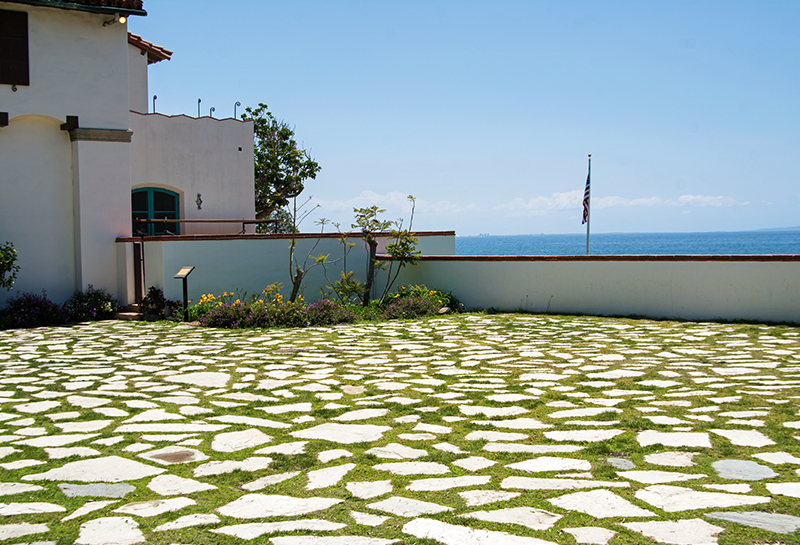 Built in 1929, it sits on one of the most premier oceanfront spots in all of Southern California. In 1968 the State of California bought the property and it is now a National Historic Site plus a California Historical Landmark. There is so much more involved in the history but let’s leave it at that and get to the actual tour! The view from the court yard. The tide pools are to the left.